Reading the Rocks: the Remarkable Maps of William Smith explores the life and work of William Smith (1769 – 1839), who is credited with creating the first nationwide geological map. Smith’s beautifully hand-coloured maps are icons in the world of geology. Amgueddfa Cymru — National Museum of Wales holds more original versions of these spectacular maps than any other public institution in the world. Two different editions will be displayed, along with unique documents and smaller maps, all depicting the story of Smith’s life and work. This exhibition was originally shown at National Museum Cardiff in 2015, as part of the William Smith Bicentennial celebrations. The Learning activities are funded with thanks to SRK Consulting. To coincide with Reading the Rocks, Oriel y Parc will also be showing The Colour of the Earth: Art and the Material Landscape. In 2015, as part of a residency at the School of Earth Sciences at the University of Bristol, artist Rodney Harris re-created William Smith’s map of 1815 using geological pigments made from corresponding ground-up rock samples from each area of the UK. The resulting full-scale map is a unique and surprising overview of the true colours of the British landscape. 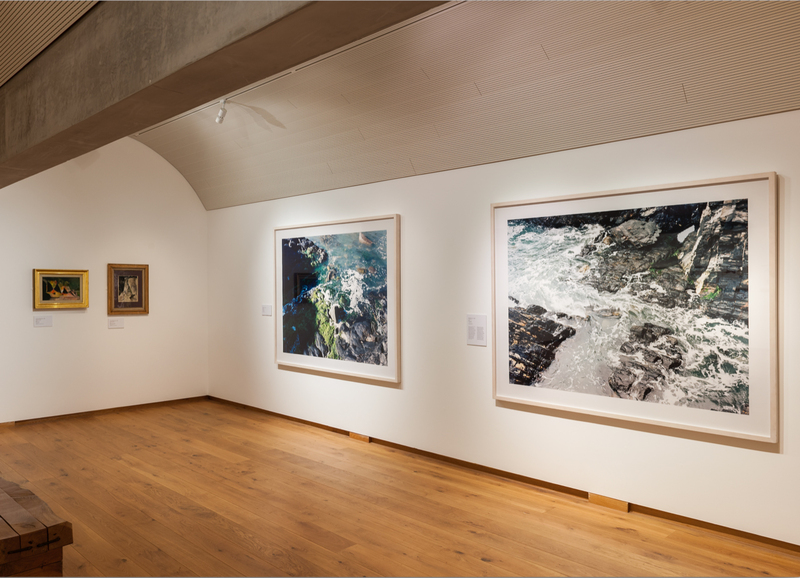 Harris’s map will be on display at Oriel y Parc, alongside work by four artists for whom the material or geological nature of the Pembrokeshire coast has been a starting point for their practice – Adam Buick, Brendan Stuart Burns, Mike Perry and Graham Sutherland. Mike Perry’s Abereiddi series explores the relationship between landscape photography and abstract painting. Here, Abereiddi is shown as an arrangement of form and colour, with Perry’s interest being the material nature of the location rather than the location itself. 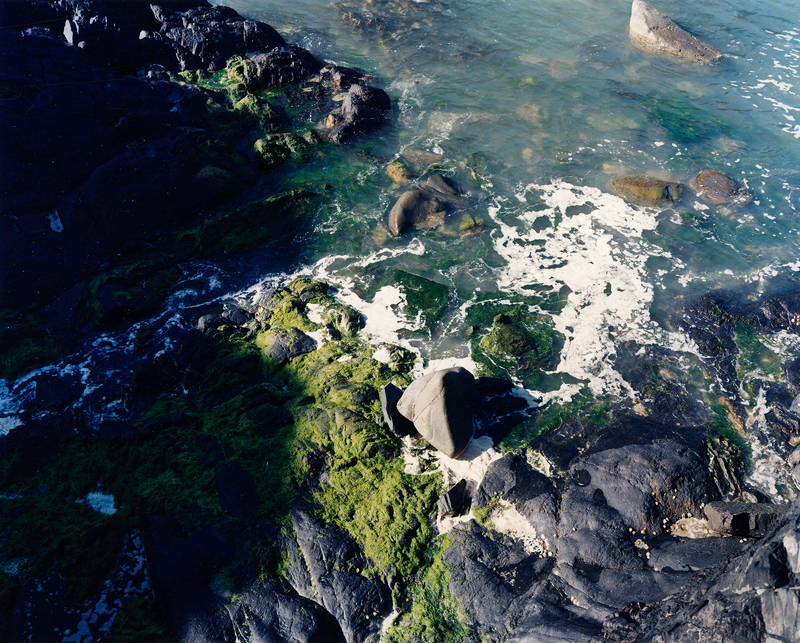 Purposely avoiding dramatic lighting, Perry shoots in overcast daytime conditions which allow him to capture the soft, monochromatic tones of rock strata and sea. Mike Perry looks down upon the Abereiddi shoreline with humility and awe. The beauty he finds there is so unaware of its audience, so self-contained, that it almost punishes the vanity of the pleasure we find in it. Yet, where exactly, is the artist? The position of the camera is difficult to identify or measure; the photographs seem to be taken as if the camera were hovering, impossibly, above the rocks. We don’t experience the landscape as if from the perspective of an artist seeking a picturesque composition, but rather as if from the casual glance of a seagull, stone or tuft of grass. This denial of a dramatic or picturesque composition grants the landscape a fierce independence. Perry’s ongoing interest in abstract art and its relation to Modernist photography remains a powerful stimulus at Abereiddi. The flattened space and vertiginous perspective allow abstraction to overtake depiction. The combination of dark, intractable blocks of stone and scribbles of white foam suggests the alternating spaces of order and turmoil in a Jonathan Lasker abstract. The Stoics thought nature, God and reason were one and that peace of mind was achievable only by obeying their laws. Baudelaire, on the other hand, saw nature as a filthy inevitability, the origin of all vulgarity and vice. “Good”, he said, “is always the product of some art”. Perry’s photographs set out to find a whiff of both goodness and art. The goodness is in the pursuit of objectivity, which is also an implied ethics of looking at the natural world; the art is in the pleasure he finds, and captures for us, in it’s surfaces. A photograph will always fall short of capturing this ideal, but for Perry, photography is a method to carry on and a ritual to placate a few angry gods. And all gods, William Blake reminds us, reside in the human breast. Mike Perry’s photographs reveal that nature’s dreadfulness, and its indifference, is ours, too. It’s beauty is its own.